Summarized here you will find, verbatim, the 18 consensus conclusions of two recent “state of knowledge” scientific reports on global warming and climate change. 1. Primarily human caused, global warming stands proven. 2. Recent global temperatures demonstrate the role of humans in creating global warming. 3. Greenhouse gas emissions surge. 4. As with many other countries, the United States experiences present climate changes -- and projects that they will grow. 5. Acceleration of melting ice-sheets, glaciers and ice-caps. 7. Current sea-level rise underestimated. 9. Widespread climate-related impacts occur now -- and will likely increase. 10. Water sources stressed by climate change. 11. Crop and livestock production challenged by climate change. 12. Human health risks increase. 13. Many social and environmental stresses made worse by climate change. 14. Coastal areas face increasing risk from the rise of sea-levels and storm surges. 15. 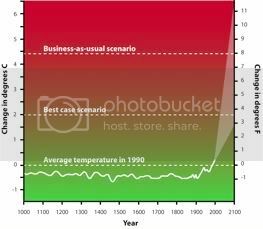 Climate-related events will cross thresholds leading to large changes in both climate and ecosystems. 16. Delaying action could trigger “tipping points” and risk irreversible damage. 17. The turning point must come soon. 18. Future climate change and its impacts depend on choices made today. Global annual average temperature, measured over both land and oceans. Red bars indicate temperatures above, and blue bars indicate temperatures below, the average temperature for the period 1901-2000. The black line shows atmospheric carbon dioxide (CO2) concentration in parts per million (ppm). Global as well as local solutions to climate change entail a transformation in the way we think about planet Earth. We attain a fundamentally new understanding of our planet, when we recognize the atmosphere as forming an integral part of Earth. 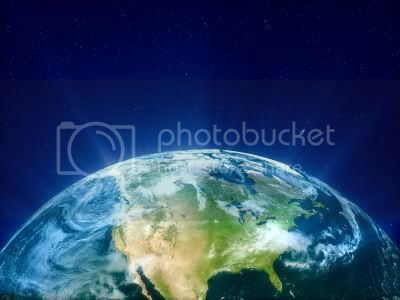 The radius of Earth extends to the top of the atmosphere. The planetary surface of Earth is the outermost, thinnest portion of the atmosphere, interfacing the vacuum of interplane-tary space. The Sun’s radiant energy enters the interior of the planet when it crosses the surface boundary at the top of the dayside atmosphere. In this system, climate and weather are fully integrated into the planet. At present, our lives are modulated by the false supposition that the land and ocean surfaces constitute the planet’s surface. Without scientific evidence, the atmosphere is consigned to a space exterior to the planet. The atmosphere is thought to be just a covering. This incomplete understanding of planet Earth is rooted in the failure of scientists, until now, to physically integrate the atmosphere into the planet. Earth Sciences Project (ESP) is the first to describe the atmosphere-integrated Earth model and to demonstrate elsewhere mathematically that Earth’s surface is located, not at mean sea level, but at the top of the atmosphere. The radius of Earth must extend in height above the land and sea surfaces to include the entire hydrologic cycle—including all atmospheric cycling of water—under the planet’s actual surface boundary. The entire volume of atmospheric gases forms an integral part of planet Earth. Think, now, about how planet earth is presented by NASA and NOAA, by the United Nations’ Intergovernmental Panel on Climate Change, and by all modern textbooks: They universally claim that the radius of earth extends to mean sea level; the land and sea surfaces are said to make up the planetary ‘surface.’ Standing upon the ground, we buy into the false notion of standing on earth’s surface. This is what all kids and grad students are taught in school. In maintaining that the radius of earth extends only to mean sea level, scientists and policymakers are left with the dubious explanation that the atmosphere overhead is only a sort of ‘blanket,’ which surrounds the earth proper. The atmosphere is not considered part of the planet, but merely a covering. And it is just this sort of thinking which conveniently gives the fossil-fuel industry license to treat the atmosphere as a dumping ground for greenhouse gas emissions. The ESP planetary model is innovative in transforming Earth’s atmosphere into an integral part of the planet’s composition and structure. The import of transfiguring the planet like this is to enlarge our vision of Earth and make it more inclusive. The model serves as a recipe for changing “surface-based,” anthropocentric views into more inclusive, biocentric views, where the entire biosphere is seen to be an interior volume of the planet, possessing simply-connected topology. By living and working, not on the surface, but within the interior of the planet, there comes the thunderbolt: Mother Earth physically and wholly embraces us. To conduct our lives inside the planet, enfolded within Mother Earth, is to realize being physically connected to weather and climate. By integrating the atmosphere into the planet, ESP specifically integrates climate forcing and weather severity into the interior of Earth. As things now stand, global greenhouse gases, once emitted into the atmosphere, are no longer part of earth. When a volcano erupts, the plume of ash and gases injected into the atmosphere is no longer attached to planet earth. Atmospheric CO2 from fossil fuels, once emitted from earth’s ‘surface’ into the atmosphere, can no longer be inside earth—can not be connected in any physical sense to the planet. Here are several consequences. Climate modelers—sitting at their computers on the ‘surface’ of planet earth—can not possibly be connected, physically, to the very climate that they are modeling. They can not be connected as long as they operate under the assumption of doing climate science on the surface of a rocky planet, with the greenhouse gases circulating overhead, outside the planet. Similarly, climate change activists and policymakers—conducting their work on the ‘surface’ of planet earth—can not possibly be connected, physically, to the very climate whose anthropogenic change they are working to mitigate, because climate, by this logic, lies outside the ‘surface’ of the earth. The ESP Earth model establishes our physical interconnectedness with the whole planetary system. What then sustains us in our daily lives is the commitment to embrace this physical connectedness in a manner which organically complements, as well as reinforces, our spiritual connectedness with Mother Earth. In so far as we take up residence in the planet’s interior, we become able to envision climate reality. And to the extent that we enlarge our vision and tune in to climate reality in the planet’s interior, Mother Earth will reciprocate, we believe, by enfolding us within herself and providing the wisdom and strength to live in harmony with Nature.